On TV, Women Who Have Abortions Are Younger, Whiter And Wealthier : Shots - Health News An analysis of TV shows finds that fictional characters getting abortions are better off than the average American who has an abortion, and are also less likely to already be raising children. 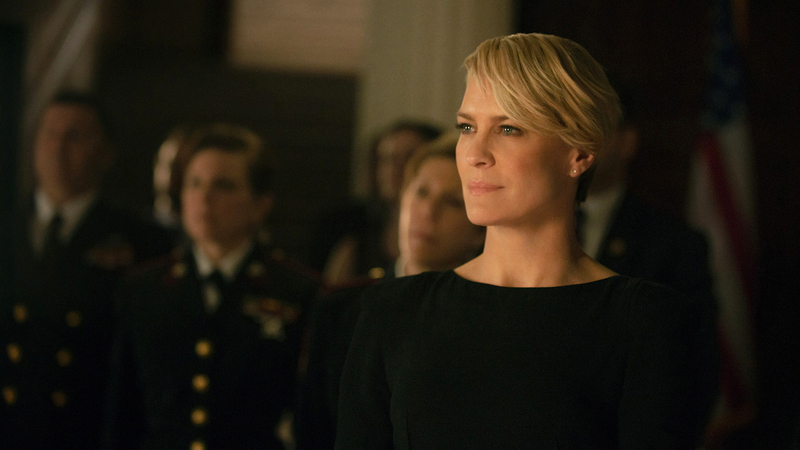 Robin Wright's fictional character Claire Underwood in the Netflix series House of Cards is a favorite of TV critics and fans. But the demographics of real U.S. women who have abortions are very different from the TV character's. The group looked at all depictions of abortion on U.S. television shows from 2005 to 2014. This included both network television shows and other distributors, including Netflix and Showtime. They found that TV characters who had abortions were younger, whiter, wealthier and less likely to be raising children than the average American woman who has an abortion. "It's not that these portrayals are inaccurate. They're going to represent someone's reality," says Gretchen Sisson, a research sociologist with the UCSF research group Advancing New Standards in Reproductive Health. "But, in aggregate, they're not reflecting what's really happening in the real world. So, what we would like to see is a greater diversity of stories told on television" about women who seek abortions. Abortion is a common procedure in the United States. About a million were performed in 2011, the most recent year for which statistics are available. Three in 10 women have an abortion by age 45. In Sisson's study, published online this month in the research journal Contraception, about a third of the television characters having abortions were under age 20, about a third were in their 20s, and about a third were in their 30s. In reality, nearly 60 percent of women who have abortions are in their 20s. Nearly 90 percent of the fictional characters were white, versus 36 percent in real life. About 30 percent of American women who choose abortions are black and about 25 percent are Latino. Fictional characters were also far less likely to be parents — about 15 percent versus more than 60 percent in real life. "All these factors work together," Sisson said, "to build an interesting social myth, which is that women who get abortions aren't mothers and they don't want to be mothers." The truth, she says, is that "the majority of women getting abortions are already parenting, and the vast majority intend to parent during their lives." TV depictions of the reasons for abortion were also not reflective of the reasons real women obtain the procedure. Characters on television tended to say they were choosing abortion because having a child would interfere with educational or career plans — what Sisson called "self-focused" reasons. In reality, women tend to cite "other-focused" reasons. In particular, women will often cite a need to take care of the children they have or that they can't afford another child, Sisson said. "Taken together, this pattern of reasons can contribute to the construction of abortion as a self-focused decision, and to the belief that abortions are 'wanted' because of personal desires rather than 'needed' because of circumstances such as poverty," the researchers say in their report on TV depictions. More than 40 percent of U.S. women who have abortions have incomes below the federal poverty level, the researchers note, but on television, 82 percent of characters having abortions were affluent or middle class. Sisson says abortion is a "stigmatized procedure" that few people discuss openly. "So very few people have a context for the reality of abortion care," she says, "so these fictional stories that happen on-screen can have greater power to influence perceptions of what that care looks like in real life." She cites the fictional character of Claire Underwood, deftly played by Robin Wright in the Emmy-winning House of Cards, as one example that could mislead viewers about abortion. The affluent character "lies about the number of and reasons for her abortions, and she has the abortions because she does not want children," Sisson points out. "Additionally, her doctor implies that multiple abortions might lead to infertility — which they don't." Depictions that are demographically more realistic, at least in some ways, may have other flaws, Sisson says, but they add some complexity as far as representation of the different kinds of women who choose abortion, and their motivation. Among these, she cites Shameless, where one character has an abortion because she can't afford a child, or Grey's Anatomy, which depicts a woman of color in her 30s choosing abortion. In particular, the researchers found that the death rate among television characters who had abortions was about 10 percent. In reality, data from the Centers for Disease Control and Prevention show that the risk of death for a woman undergoing the procedure is a tiny fraction of that — 0.0015 percent. While the study did not look at audience impact — that analysis is coming, Sisson says — she theorizes that depictions of women choosing abortion may already be influencing public policy. "It's easy to postulate," she says. "If you see a lot of stories where women are changing their mind in the waiting room, then public policies such as waiting periods might make sense. ... If you see a lot of teenagers getting abortion on television, then policies such as parental consent or parental notification laws might make sense." In addition to the analysis of audience impact, Sisson says a review in the coming months will look at television depictions of abortion providers. This story was produced by KQED's blog State of Health.